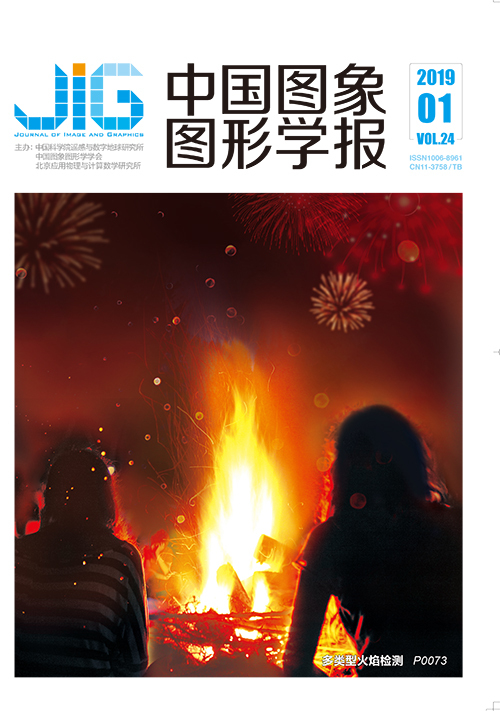 高勇, 男, 教授, 博士生导师, 主要研究方向为电力电子器件与功率集成、新型半导体器件。E-mail:gaoy@xaut.edu.cn. Objective Vision is one of the most important ways by which humans obtain information. Visual prosthesis refers to the process where electrodes are implanted into a blind body to stimulate the optic nerve, such that the blind can see hallucinations. Therefore, the objects felt by the blind are only the general features, such as low resolution and poor linearity. In some cases, the blind can hardly distinguish optical illusions. Before the electrodes were stimulated, image segmentation was adopted to display the general position and outline of objects to help blind people clearly recognize every familiar object. 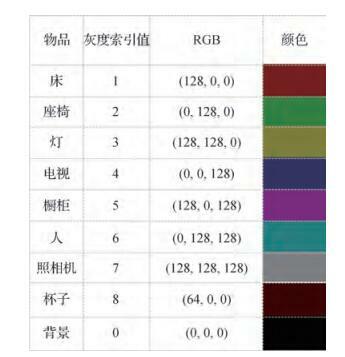 The image fast segmentation of the convolution neural network was proposed to segment the indoor scene of visual prosthesis in terms of its application features. Method According to the demand of visual prosthesis for real-time image processing, the fast fully convolutional network (FFCN) network structure proposed in this paper was improved on the AlexNet classification network structure. The network reduced the error rate of top five in the ImageNet dataset to 16.4%, which was better than the 26.2% of the second. The AlexNet uses the convolution layer to extract deep feature information, adds the structure of the overlapping pool layer to reduce the parameters that must be learned, and defines the Relu activation function to solve the gradient diffusion of the Sigmod function in deeper networks. In contrast to other networks, it presents characteristics such as light weight and fast training speed. 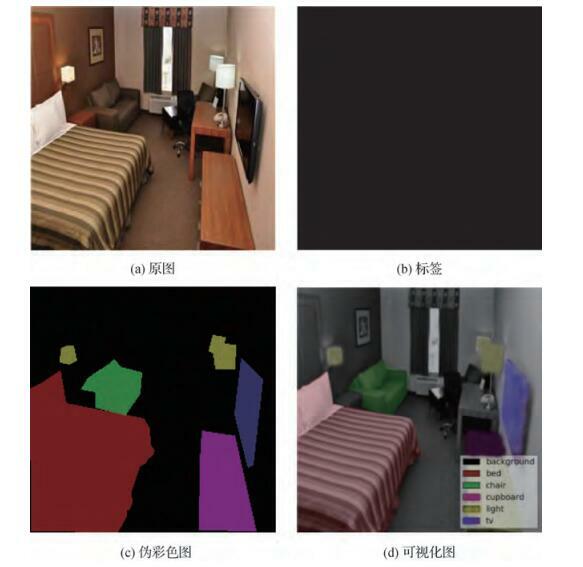 First, the FFCN for image segmentation in the indoor scene was constructed. It was composed of five convolution layers and one deconvolution layer. The loss produced by the continuous convolution in the picture feature information was avoided by scale fusion. To verify the effectiveness of the network, a dataset of basic items that can be touched by the blind in an indoor environment was created. 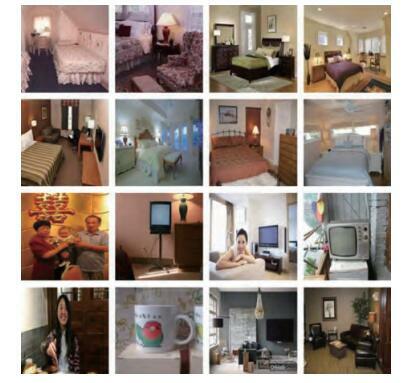 The dataset was divided into nine categories and included 664 items, such as beds, seats, lamps, televisions, cupboards, cups, and people (XAUT dataset). The type of each item was marked by grayscale in the original image, and a color table was added to map the gray image into pseudo-color map as the semantic label. The XAUT dataset was used to train the FFCN network under the Caffe framework, and the image features were extracted using the deep learning feature and scale fusion of the convolution neural network to obtain the segmentation model in the indoor scene for adapting to the visual prosthesis for the blind. 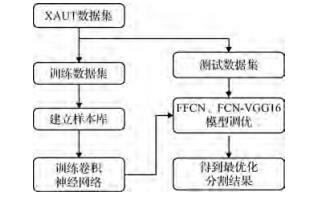 To assess the validity of the model, the fine adjustment of traditional models, including FCN-8s, FCN-16s, FCN-32s, and FCN-8s at-once, was examined. The dataset was used to obtain the corresponding segmentation model in the indoor scene for adapting to the visual prosthesis for the blind. Results A comparative experiment was conducted on the Ubuntu16.04 version of the Amax Sever environment. The training time of the model lasted for 13 h, and a training model was saved every 4 000 iterations. The tests are tested at 4 000, 12 000, 36 000, and 80 000 iterations. The pixel recognition accuracy of all kinds of networks exceeded 85%, and the mean IU was above 60%. The FCN-8s at-once network had the highest mean IU (70.4%), but its segmentation speed was only one-fifth of that of the FFCN. Under the assumption that the other indicators differed insignificantly, the average segmentation speed of the FFCN reached 40 frame/s. Conclusion The FFCN can effectively use multi-layer convolution to extract picture information and avoid the influences of the underlying information, such as brightness, color, and texture. Moreover, it can avoid the loss of image feature information in the network convolution and pool through scale fusion. 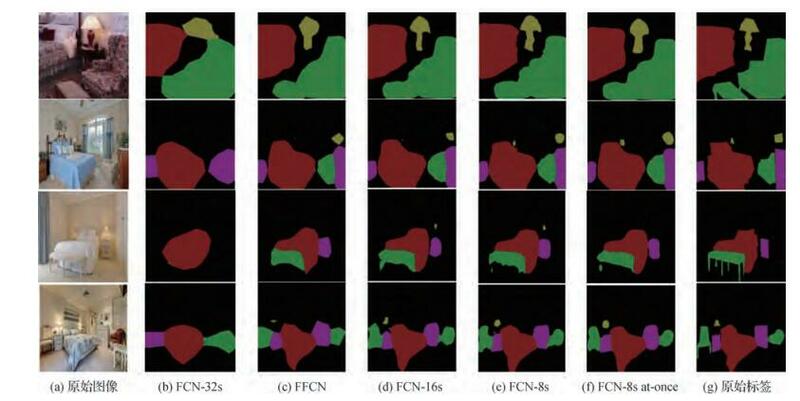 Compared with other FCN networks, the FFCN has a faster speed and can improve the real-time image preprocessing.